VATICAN CITY (CNS) — Backstabbing and gossip hurt people and harm God’s desire for a united human family, Pope Francis said. The pope also asked people to pray for persecuted Christians in the world and to be genuinely concerned about their plight, just as one would be for a family member in distress. But the pope asked people to reflect upon whether they live out this unity or are they uninterested — preferring to be closed off from others, isolated within their own community, group of friends or nation. The pope said talking badly about others hurts everyone, including the church and communities. “Christians must bite their tongues before gossiping,” he said. “That will do us good because that way the tongue swells up, and you can’t talk” badly about others, he said to laughter and applause from the crowd. He asked people to have the humility to repair the divisions in one’s life “with patience and sacrifice” and follow the Prayer of St. Francis to be instruments of God’s peace. “Humility, gentleness, magnanimity and love for preserving unity are the real pathways of the church,” he said. Because the Holy Spirit is the real “engine” behind the life and renewal of the church, prayer is important. Unity in diversity comes from the Holy Spirit, which everyone received with baptism and confirmation, he added. 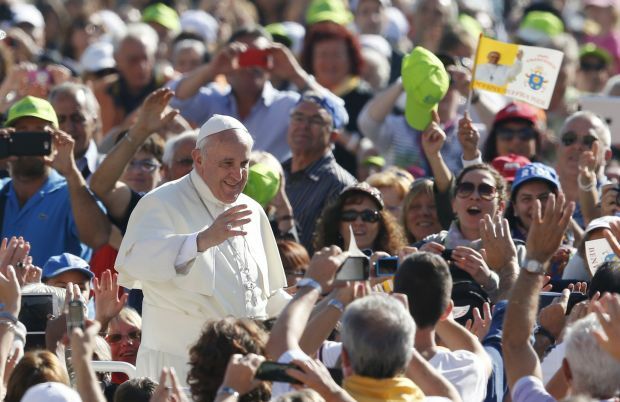 The true richness of the church “is what unites us, not what divides us,” he said.